Life purpose is a high-level calling about how we choose to live our lives. It is a reference point or beacon for our goals and daily activities. Our purpose is the essence of our being and it serves to guide us in making important choices on how we spend our time and live our lives. I can discern and articulate my life purpose and values. Your life purpose likely has some of the following characteristics: a “calling” or link to God, spending a lot of time with flow and energy, serving others, building something (legacy) and extending over long time period. You know you are living your life purpose because you don’t grow tired pursuing it. It is a passion. Your strengths and talents are leveraged for something beyond you. “The purpose of your life is far greater than your own personal fulfillment, your peace of mind, or even your happiness. It’s far greater than your family, your career, or even your wildest dreams and ambitions. If you want to know why you were placed on this planet, you must begin with God. You were born by his purpose and for his purpose.” Source: The Purpose Driven Life: What on Earth Am I Here For? by Warren, Rick (2012-10-23). Develop an understanding of your God-given talents (your strengths). Develop an understanding of your passions (a topic or focus area that is hard to stop working on). Click here for some questions to reflect on. Develop an understanding of your personal needs (emotional, intellectual, spiritual, physical, financial, etc). Review some of the example purpose statements below. Use the Purpose Worksheet below (preferably with a mentor). Write a draft purpose statement for yourself. Think about it as you live it. Modify it if necessary. “Purpose is being. Vision is seeing. Missions are doing. Values are choosing. Why am I here?—the purpose question; Where am I going with my life?—the vision question; What do I need to be doing?—the mission question; and finally, the values question—What is truly important?” Source: The On-Purpose Person (book) by Kevin McCarthy. Talents. Our talents are not just our jobs but the (transferrable) skills that enable us to do our jobs well, e.g. coaching, artistry, problem solving or project management. Values. See list on Values.com. Mazlow’s Hierarchy of Needs. Abraham Maslow developed a theory of personality that set up a hierarchy of five levels of basic needs: physiological (e.g. food, water), safety, love/affection/belongingness, esteem and self-actualization. Our receptiveness to a broader life purpose will evolve as we move from survival to self-actualization. Example Purpose Statements: Source: http://andrewschultz.com/examples/ (since deleted). I serve to energize, connect, and inspire purpose in others. My mission is to enliven, encourage, and reinspire the love of music for children in public schools. My purpose in life is to be a mom: to empower independence, self-reliance and confidence in others through being a positive, supportive role model. My life purpose is to live and mentor an authentic, adventurous, spiritual life, while being a catalyst for positive change. Six short exercises are presented in the article “What Do You Want to Do with Your Life” by Dr. Robert Holden on Oprah.com. See The Life Purpose Exercise by Jack Canfield on BetterNetworker.com. How much of you daily activity is spent in a meaningful way, consistent with your purpose? 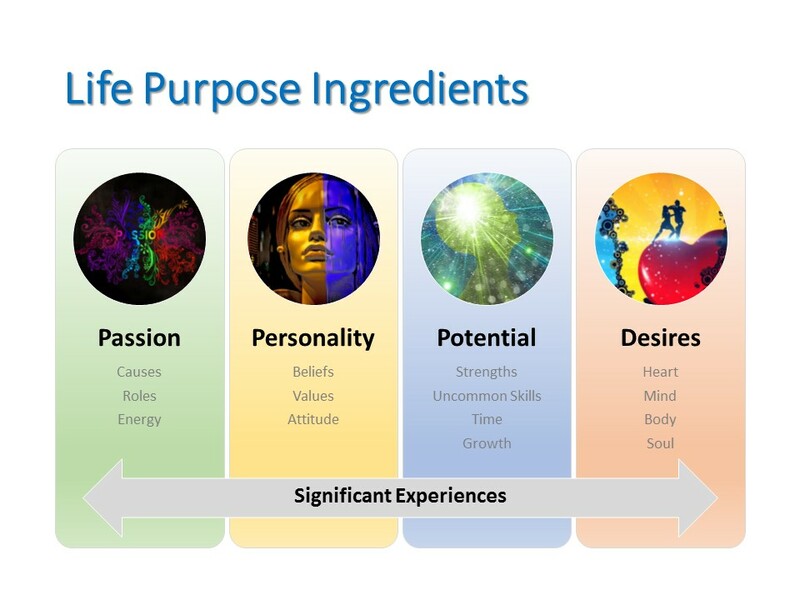 How could you use your talents, passions and values to serve or contribute to people, causes or organizations? If you were to write your own obituary, what would it say? What do you want to be known for? What is your legacy? Live with Purpose Roadmap. This outlines the needed skills to Know Yourself Deeply, Develop a Life Plan and Live to Your Potential. Purpose Worksheet. Adapted from the Matthew Kelly’s model in the Rhythm of Life book. Live to Your Potential Worksheet. Purpose. Reason for existence: the reason for which something exists or for which it has been done or made. Values. Important and lasting beliefs or ideals shared by the members of a culture about what is good or bad and desirable or undesirable. How to Know Your Life Purpose in 5 Minutes by Adam Leipzig on YouTube. (Who you are, what you do, who you do it for, what those people want and need). Kevin McCarthy produces a regular video blog, many videos can be found here. Click on one of the “values” words at this link to see many video’s on Values.com. 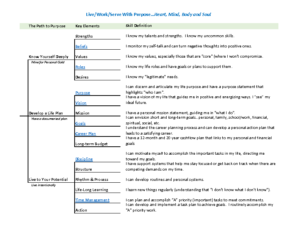 Purpose and Goals (for older teens and adults with instructor notes). Contact us.